Conspiracy videos of 9/11 on Facebook: People should be responsible for what they share on social media. That conspiracy video going around Facebook is a lie. 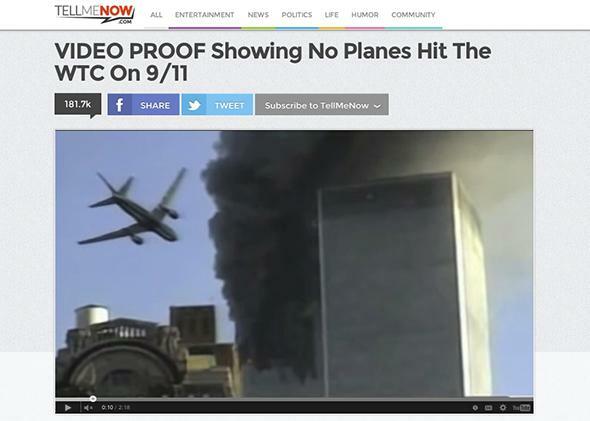 No, it’s not video proof. A friend on Facebook uncritically shared a piece of crazy the other day. I know, your friends do, too. But here’s the thing: This friend is a normal. He’s not one of those once-rational legacy friends from high school you would never befriend today who litter your feed with nonsense. He knows that the Earth orbits the sun, that evolution provides the best explanation for the diversity of life, that our planet is warming up. He has spiritual, political, and artistic views, but he doesn’t think any of them take the place of factual reality. He’s a photojournalist and a fine one, a fine citizen, and a fine man. You can predict the rest. My friend is a normal, I thought. What on earth can this video show that gets over the bar with sufficient clearance that my normal friend would share it? Plus, you know—deadlines, procrastination, reality. So of course I watched the video. It’s 2:18 long, and it makes basically one claim: that a video of the second plane crashing into the World Trade Center’s south tower shows the plane passing a building that, says the voice on the video, is “clearly behind the south tower.” Yet the plane’s wing disappears behind the building. According to the person who made the video, this is indisputable evidence of a “layering CGI glitch” (note the technical language), and thus the whole thing is obviously a hoax, something, something government control, media conspiracy, blah blah blah. The video was originally posted May 27. When last I checked, it had more than 2.5 million hits. When something is stupid beyond imagination, I know what to do: Walk away. Yet I couldn’t let it go. For one thing, my friend’s Facebook post was filling up with annoyed responses from his many other normal friends, and I kept thinking: How many hours have been wasted today by usually productive people who could have otherwise been … watching cat videos or something? I get that people can waste their time how they like, and freedom of speech means you can publish and share any addled, paranoid rant, but 2.5 million hits is 2.5 million wastes of 2:18. That’s 5 million minutes. That’s closing in on 100,000 hours that people spent watching this hooey. I finally figured out why the pure wrongness of this particular waste of time wouldn’t let me go: Not that it was crazy, but that it was so provably—so easily provably—wrong. Global warming? That involves big data, statistics, and debates about weather versus climate, and there’s plenty of room for genuinely well-meaning people to fall into error. Evolution? Even most people who claim to understand it can’t clearly explain it, and you can forgive a certain amount of confusion. It’s frustrating having to argue about things like evolution and climate change, but it’s the cost of doing business in a world where everyone gets to talk, not just people who know what they’re talking about. But this? This was making a very specific claim: The airplane magically disappeared behind a building that was behind the tower when we know the airplane was in front of the tower. This was a disprovable claim. It took me about 10 minutes. The most obvious way for a plane’s wing to “disappear” behind a building would be for the building to be not behind the plane, as the narrator claims, but in front of it. 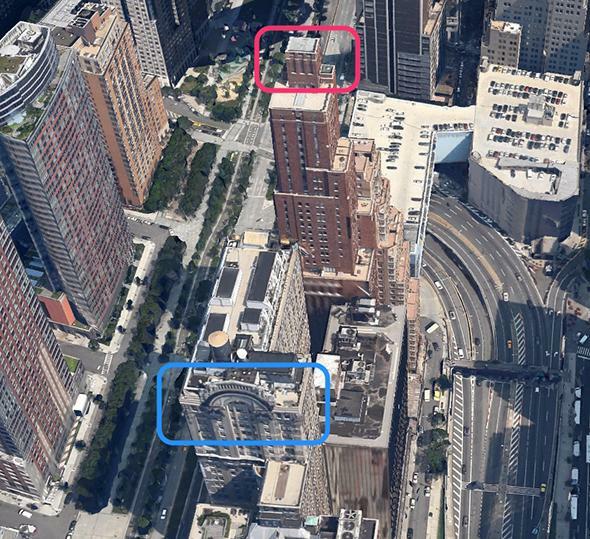 A glance at Google Maps showed blocks’ worth of buildings south of where the tower stood. The video shows a distinctive archway atop a foreground building, with the building in question sporting three easily identifiable vertical elements at its apex. I couldn’t find a good street view in Google Maps, so I opened Google Earth. In the time it took me to zoom down to lower Manhattan and look at the very first block north of Battery Park, there it was: that distinctive arch at the top of the building (circled in blue in the photo) and, behind it in the same block, the unmistakable vertical elements of the building (circled in red in the photo) behind which the wing “disappeared.” That is, it disappeared exactly the way you disappear when you step behind a tree: The building came between the camera and the airplane. The building is a good six blocks south of the tower—in front of it, not behind it. The single supposed fact on which the video based its 2 million–hit paranoid parade was provably wrong, in minutes. A dope was wrong on the Internet, and I proved it. Whoopee, big deal. Except it kind of is a big deal. For one thing, it demonstrates that all this quackery we waste so much time on is not stupid—it’s wicked. The person who made this video is either incredibly ignorant about basic, school-kid geography and geometry or he didn’t care that his claim was false. He was just stirring up trouble by telling lies. I later found the original video from which the snippet was sliced. Most of the video makes it impossible to believe the buildings in question are behind the south tower as he claims. He was wicked—pure and simple. And 2 million–plus people have wasted time because of it. This isn’t free speech—this is slander, making vicious claims about media and government that are demonstrably false. It’s a form of sabotage—a piece like this injures community, productivity, and trust. It’s unpatriotic, even seditious. But even that isn’t the main problem. We all know there are people out there, simultaneously stupid and wicked, who tell lies to further vicious agendas. The main problem is that people like my friend give a genial shrug and forward things like this. If that one sensible person had not shared the video, I’d probably be blissfully unaware of it. There’d be a dozen or so fewer hits on its page, and I and a few others would have gotten a little more work done. My point is straightforward but urgent: This is the front line against viciousness and madness and anti-science and anti-reason. When people post slanderous, malevolent lies, if you forward them without censure, then you are abetting slanderous, malevolent lies. Forget that line on so many people’s Twitter page about retweets not constituting endorsement. Sorry, wrong. If you share something on any social medium, you’re saying, overtly, that you approve of it being shared. That you think it’s worth people’s time. That its point is either valid or worthy of consideration. We need to adopt a new ethic. The entire point of the Internet is that anything can be put out there, without research or editing or fact-checking. That means every one of us is responsible for fact-checking our feeds, and crying foul when we see a foul. You share it, you stand behind it. Seeing something vaguely worth wondering about (if you don’t think about it too hard), then pressing share, is a losing strategy. You’re not allowed to turn off your judgment, even for a second. You’re not allowed to shrug and say, “Who knows?” and let someone else worry about it. That’s how we got into this mess. So think—and above all check—before you share. If it’s a lie, by perpetuating it you claim at least a portion of the responsibility. Think about it. We don’t have 2 million hits a week to spare.